The development of the beverage industry for soft drinks, shelf-stable items and water is paralleled by the development of suitable packaging that provides physical support for the product in addition to providing a reasonable shelf life for the contents. In this fast paced world, consumers are habituated to use beverages which either satiate their hunger or work as an instant energy booster. Beverages sell instantly not only because they offer great taste and/or superb nutrition value, but their aesthetic appeal (as provided by packaging) also encourages consumers to opt for them. From coffee to green tea to energy drinks, instant soups, flavored packaged drinks, these beverages come in several packaged forms. Ester offers efficient flexible packaging solutions to ensure great taste, tremendous value, and high nutrition integrity in a compelling way. 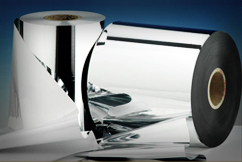 Our solutions include value added Polyester Films (flexible packaging) such as Metalised Ultra High Barrier film , Transparent High Barrier film and Gold Metalised film to protect the beverage from contamination, maintain the product quality, enhance consumer experience and convey product information. Ester also offers various rigid packaging solutions by way of Specialty Polymer resins characterized by good gas barrier, strong impact strength, supporting light-weighting and excellent process-ability thereby helping protect and preserve the contents of the product. Flagship products on offer under rigid packaging options are solutions for Carbonated beverages and Bulk beverage containers. In its early days, carbonated beverages were packed in glass, which even today provides the performance benchmark for product protection. However, with advances in PET packaging technology, a significant proportion of carbonated beverages are currently packed in PET based packaging. Bulk Beverage containers require heavy-duty packaging solutions for the safe storage and transit of bulk liquids. Our products provide the right balance of chemical resistance, durability and abrasion resistance for your packaging application to ensure the superior quality of its contents. Our core commitment to innovation, partnership and out of the box thinking helps us understand the industry better and manufacture distinctive products that make beverage packaging easier and highly effective.